Measurement of steady-state and particularly time-resolved fluorescence anisotropy offers fascinating possibilities to study molecular orientation and mobility as well as processes that affect them. Except of special cases, anisotropy does not depend on the concentration of fluorophores, thus on the detected signal intensity. Owing to this similarity with the behavior of fluorescence lifetime, we can regard anisotropy as a yet another dimension of fluorescence information. Molecules with their absorption transition moment (ATM) aligned with the polarization plane of excitation are preferentially excited. This is called photo-selection, because at the same time molecules with ATM oriented perpendicular to the excitation polarization plane are not excited, they remain in their ground state. Subsequently, the polarization plane of an emitted fluorescence photon is defined by the orientation of the emission transition moment of the molecule, thus by the orientation of the molecule itself at the moment of emission. The degree of fluorescence polarization expressed as a dimensionless quantity, anisotropy, is usually the highest at the moment of excitation and then normally decreases in time. Common reason for this is the random molecular motion, e.g. Brownian rotation or conformational flexibility that tends to randomize the initially well aligned, photoselected fluorophore population. 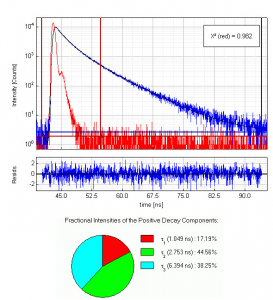 The so called anisotropy decay can be observed sometimes even in a solid sample (e.g. rigid, frozen or very viscous environment) owing to intramolecular processes or energy transfer between molecules. Time-resolved anisotropy measurement is more informative than its steady-state counterpart, the latter reporting time averaged values only, without direct insight into the dynamics of the process. 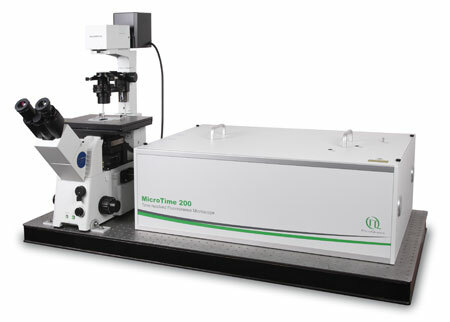 Anisotropy measurements are typically performed with standard fluorescence spectrometers using plane-polarized excitation light. Lasers usually emit polarized light; the output of LEDs or steady-state lamps is made polarized using high quality polarizers. The fluorescence emission is then detected through a second polarizer (sometimes called analyzer). 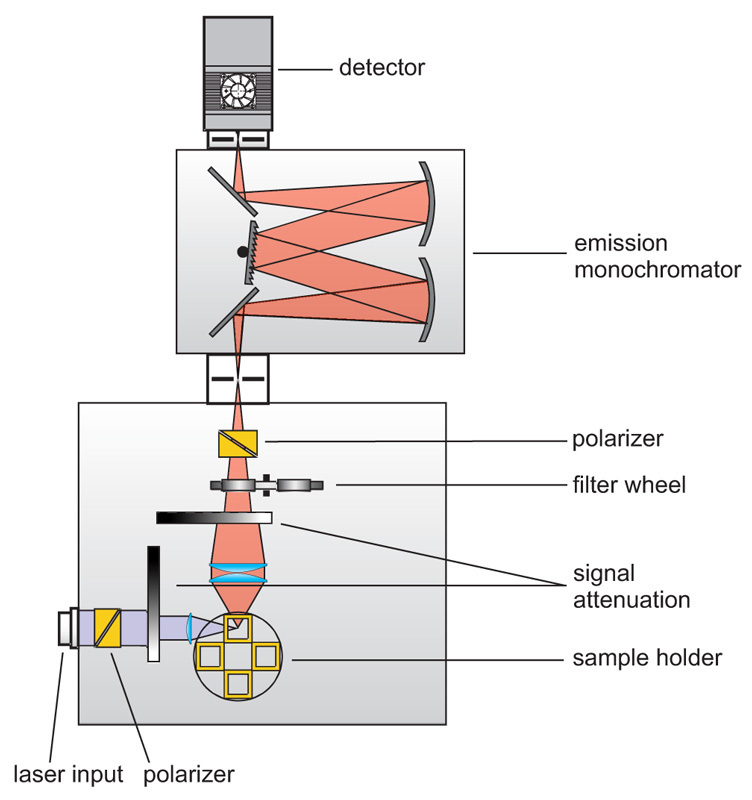 In standard fluorescence spectrometers the excitation is usually polarized vertically in respect to the plane of the optics (L-geometry). Anisotropy (-decay) is then calculated from consecutively measured vertical and horizontal polarized intensities (decays). In microscopes it is more common to use two detectors and a polarizing beam splitter inserted between them. 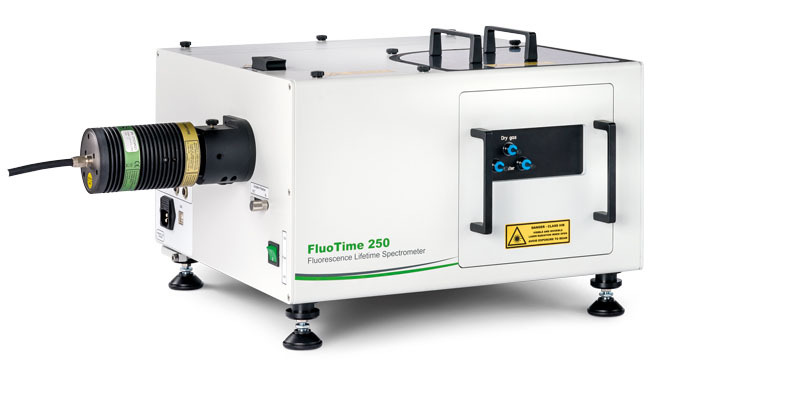 The dynamic anisotropy of Coumarin 6 was studied using the FluoTime 300. 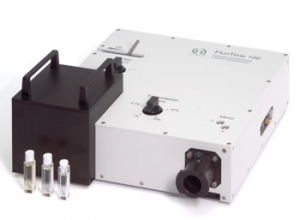 The system automatically set the sample temperature, and at each temperature step, four measurements were automatically performed: IRF and VV (parallel), VH (perpendicular), and VM (magic angle) polarized decay measurements. A quick analysis of VV and VH decays clearly shows temperature dependent behavior of the emission anisotropy. 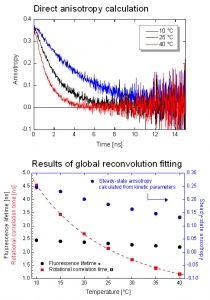 For detailed quantitative results, global reconvolution anisotropy analysis of the data set was performed. A model of a single, spherical, rotating particle with a single exponential fluorescence lifetime proved to describe the system very well, as expected for a small, highly polar particle in polar solvent. The result reveals the slightly temperature dependent single exponential fluorescence lifetime of Coumarin 6. The temperature dependence of the viscosity could be fitted to the experimentally obtained change of the rotation correlation times. 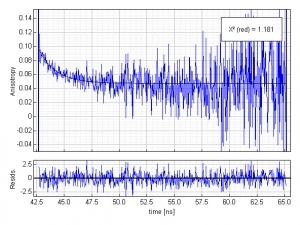 Even a precise calculation of the steady-state anisotropy values was possible which were found to be in perfect agreement with the anisotropy values estimated by the Perrin equation. Full length apomyoglobin has 154 amino acids including two tryptophans and three tyrosines. A 5 µM solution of this protein in acetate buffer was excited at 280 nm. Glan-Taylor polarisers where used in order to select the vertically polarized component of the excitation light and the magic-angle polarized component of the fluorescence. 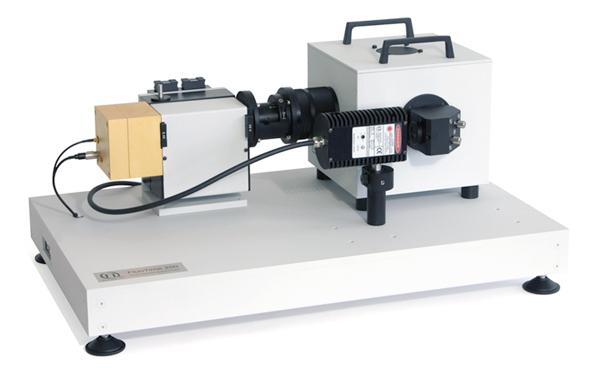 The collected emission passed a monochromator set to 350 nm with 30 nm bandpass. The measured instrument response function (IRF) has a FWHM of 700 ps and 1.2 million counts were collected within 4 minutes measurement time. The analysis of the measurement results showed that in this case the decay is best described by a triple exponential decay funciton. 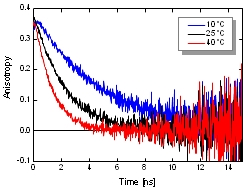 The picture shows the IRF (red), the measured decay (blue) and the result of the fit (black) along with the three recovered lifetimes and their fractional intensities. Further information about the protein dynamics can be obtained by a quick anisotropy decay analysis. Two more histograms were collected, the so called parallel and perpendicular polarized decays. The simplest anisotropy analysis involves a direct calculation of the anisotropy decay curve R(t) from those polarized decays. 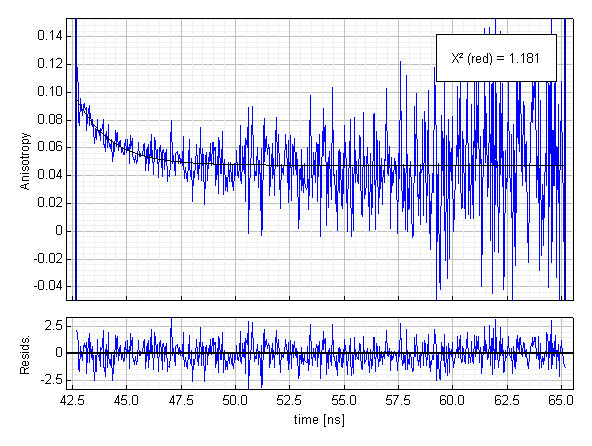 The necessary G-factor was determined in an independent decay measurement with horizontally polarized excitation.The picture shows the time evolution of the anisotropy (blue) during the first 20 ns and a fitted single exponential decay curve (black). The time resolved anisotropy reveals an average rotational correlation time of 1.6 ns and a residual anisotropy of 0.05. This residual anisotropy is a clear indication of a slower process, which cannot be resolved using the fluorescence of tyrosine and tryptophane as an indicator. In fact, the expected rotational correlation time of apomyoglobin is in the order of 7-8 ns and this process is most likely the reason for the residual anisotropy. ECF-transporters present in most bacteria are responsible for the uptake of vitamins, micronutrients and intermediate products. The importers consist of three components: a substrate specific membrane protein (S-unit), an integral membrane spanning part (T-unit) and a nucleotid binding protein with ATP-binding site (ABC). Whilst T-unit and ATPase are conserved, the S-subunit varies giving the whole transporter its name “Energy Coupling Factor”, ECF. The S-unit responsible for biotin-uptake (BioY) is also active without T and ATPase parts. Therefore, interactions between BioY units were expected. HOMO-FRET between mYFP-BioY was used in E. coli mutant to prove dimerization. A decreased mean anisotropy of 0.21 was indicative of HOMO-FRET in bacteria containing only labeled BioY (see upper image). As a control, in another variant, mYFP-BioY was expressed along with an excess of unlabeled BioY. This caused a reduction of HOMO-FRET and an increase in anisotropy towards 0.25 (lower image). With these experiments a dimerization of BioY could be demonstrated. 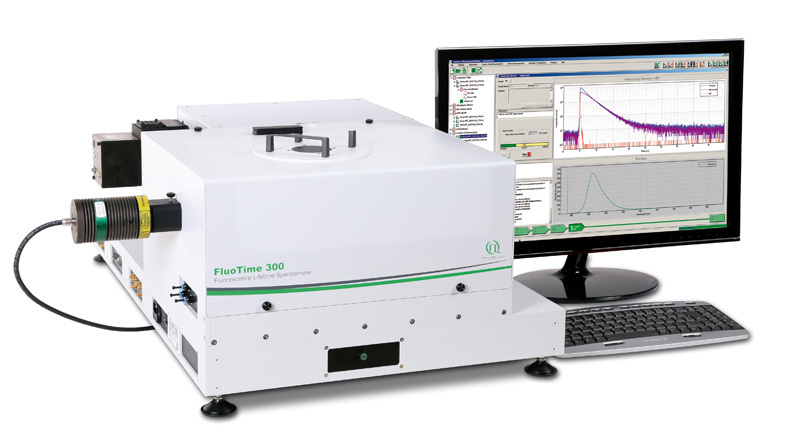 The anisotropy mean values of 0.25 and 0.21 were measured on a Fluorescence Lifetime Spectrometer FluoTime 200 in suspension. 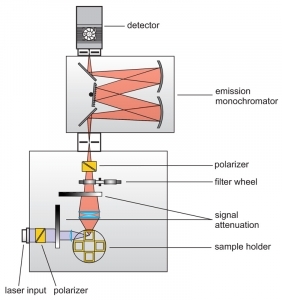 The G-Factor of the microscope was calibrated in a way that the mean anisotropy of the high anisotropy cell line matched the spectrometer value. When doing this, the mYFP-BioY expressing bacteria showed an anisotropy value matching the spectrometer value of 0.21. A specific viral membrane protein (v.m.p.) which is part of HIV protein, is responsible for membrane fusion of the HI virus with the T-cell membrane. After infection and synthesis it is known to be transported to the plasma membrane via intracellular transport vesicles, Golgi apparatus and ER. Living Chinese Hamster Ovary (CHO) cells transfected with v.m.p-mYFP showed a lower anisotropy value at outer cell membrane compared to the intracellular protein localization (Fig. A). To clarify if this decrease was caused by either clustering or different mobility of the viral membrane protein at the cell surface, the cells were stained with an anti-GFP antibody to increase the molecular weight of YFP (Fig B). This would slow down the molecular rotation of YFP sticking out of the membrane into the extracellular space and resulting in an anisotropy change. Since the value was unaltered upon antibody binding, the lower anisotropy of v.m.p.-mYFP at the outer cell membrane was caused by HOMO-FRET due to clustering of the viral membrane protein. As a negative control, the anisotropy was imaged in CHO cells expressing GPI-mYFP (Fig. C). Glycosyl-phosphatidyl-inositol anchors are mainly localized at the cellular plasma membrane, do not interact or cluster and thus show a higher anisotropy compared to the viral membrane protein. The Polycholin-attached (PC) NBD dye is often used to study membrane structure and dynamics. Adherent Chinese Hamster Ovary (CHO) cells were labeled with C6-NBD-PC staining the cell membrane and their anisotropy was measured. The polarization direction of the laser is marked as a white arrow. 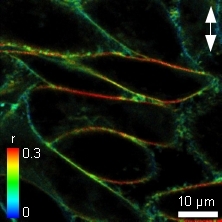 In the liquid ordered phase of membranes, NBD has a longer fluorescence lifetime corresponding to less water exposure, and the anisotropy is significantly higher at the horizontal versus the vertical membranes as shown in the Figure. Here the dye molecules have a strict orientation in respect to the membrane and show only restricted rotational movements. In contrast, in the liquid disordered phase the fluorescence lifetime of the NBD probe would be relatively low. Also the anisotropy difference between the horizontal and vertical membrane would be relatively small, as the fluorescent molecules have more degrees f freedom in orientation and/or for rotation. As the horizontal cell membranes have a high anisotropy, while vertical membranes have a lower value, this corresponds to the liquid ordered phase.